Pebble has finally released Pebble 2 App for Android (iOS version has been around for a while) and the updated Version 2 Firmware. New FW adds couple of handy features to pebble: The ability to see Power remaining and Bluetooth Connectivity status. Although to use these you may have to use a custom watchface. Also the watchface will invert colors if the connection with phone is broken. 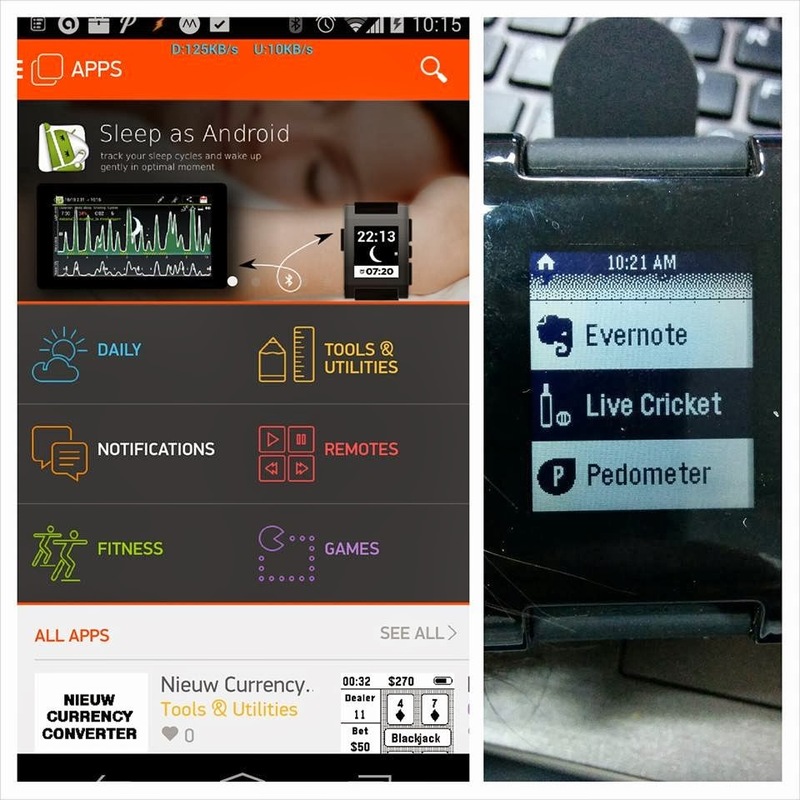 Apart from these cosmetic changes, the new app brings in the 'Pebble Appstore' enabling you to install custom apps. As you can see, Evernote, everyone's favorite note taking app is already present in the new Appstore. The app store has some really cool stuff and is worth a detailed exploration. "Namaskar, What a fine day. How are you, Sir?" "hmm... No, not a clue"
"Its okay. I get that a lot. I am the Sitting MP of this constituency"
"Oh, yeah, Now i remember. Long time no see. How long has it been? Five Years?" "I am contesting in next week's election. So I hope you and your family will vote for me"
"Oh, sure thing.. but before that you have to fill up this form"
"it's the new Saral - Vote Requisition Form"
Attested copies of Aadhar Card, Bank passbook and statement covering last 12 months, Election ID Card, Attested copies of mark lists of highest educational qualification held by you, Income certificate from Village Office, Conduct certificate issued by officer in or above the rank of a Sub Inspector of Police of police station having jurisdiction over your place of residence, Self attested copy of this year's election manifesto, Previous election manifesto and news paper clippings that prove execution of the same, and Two passport size copies"
"After evaluating the application, if you are eligible to receive votes, the eligible number of votes will be determined. The eligible number of votes will then be directly credited to your bank account via NEFT after deducting Tax at prevailing rates"
"No swearing. This is the law, take it or leave it!"